Besides the odd bowl of Laksa at Sidewok and Monkey Bar, or sparing, mediocre bao across the city, Delhi hasn't seen Malaysian food like its seen other Southeast Asian cuisine. Tamura, Guppy, Fuji and now Kofuku have been doing Japanese like it should be done and Little Saigon has made Vietnamese more affordable to those who find Blue Ginger out of reach. Jom Jom Malay, however, is here to gain first-mover advantage. The city's first exclusively Malaysian restaurant is already so popular that it requires pre-booking, and, if your dining companion doesn't arrive, will show no hesitation in asking if they could hand your table over to the next person. We don't mind, since we're fans of practicality and understand the pressures of business. But for a Dilliwala more accustomed to flattery, this might be a severe blow to the ego. Nevertheless, we were showered with attention the day we did arrive with a suitable dining companion. A basket of fresh ingredients arrived first, with the drama of a mortar and pestle in the middle. Tiny chai glasses filled with chopped onion, ginger, garlic and chilli, and salt, sugar, chilli oil and slices of lemon were arranged neatly around the centrepiece. Our waitress guided us through the readymade sauces and told us about melding the fresh ingredients to create our own. The spicy, aromatic peasant-style condiment we pounded ourselves went perfectly with our starter of laksa bao. Although the chicken could've been cooked better, the bao was soft on the outside; the laska sauce added a nice break in flavour monotony. The readymade seafood sauce on our table made it even tastier. We realised the power of the Malaysian condiment and continued to flavour the rest of our meal with both the readymade sauces and our fresh muddle. Char kway teow—flat rice noodles—were standard but made special with (again) the seafood and onion sauces. Kari kacang kuda—a very traditional Malaysian chickpea curry—was similar in flavour to a Thai yellow curry, although much thicker in texture. The chickpea chunks floating in it were reminiscent of falafel; we mopped off the preparation with Malaysian roti, which tasted eerily similar to Malabar parotta. Lingering over our meal that revived memories of other meals (including Thai and coastal Indian), we concluded that Malaysian food can feel heavy, especially given the current weather in Delhi. We had no room left to try dessert and were already beginning to contemplate a siesta. Glasses of chilled lemonade helped us wash it all down and regain some sense of needing to stay awake. 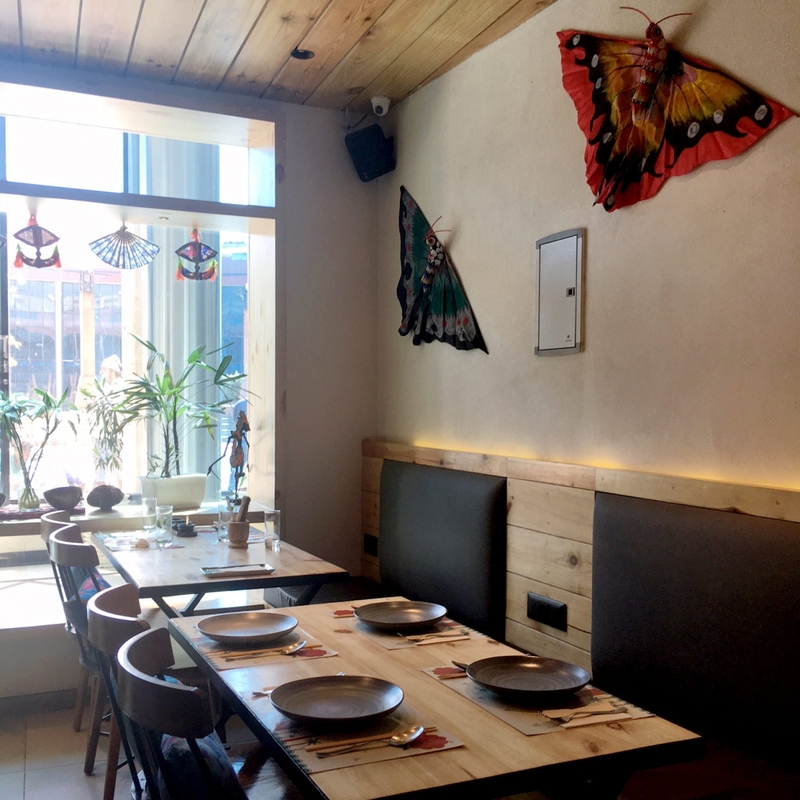 We lazily appreciated the illustrations of Penang and Georgetown tastefully hung on the walls, along with the bamboo light fittings that hung from the ceiling. The tuk-tuk right by the door seeks the most attention, though. As busy as the restaurant already keeps, the management might see even more business if they encouraged selfies against it. Opening hours: Monday-Friday noon-3.30pm; 6.30-11.30pm. Saturday-Sunday noon-midnight.